Michigan has a wide variety of Amtrak stations, varying from grossly inadequate to real jewels. Ironically, some of the worst station accommodations for passengers are in some of the highest income areas of the state. 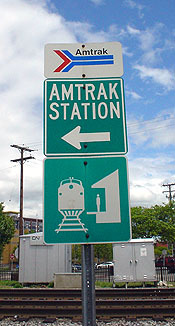 Each station served by an Amtrak train is listed below. Cities with Amtrak Thruway or connecting bus service, but no train, are not listed even though they may appear in the Amtrak timetable. The ratings and descriptions of the stations are based upon their ease of use, particularly for the first-time user. If you are using a GPS or an Internet mapping service to find the train station, please note that the street maps on the Amtrak website or the street address read by the GPS do not always match the physical location of the station. For example, Railroad Street in Durand is closed to traffic over the railroad tracks and one must navigate through a series of residential streets to reach the station. Arrive early and pay attention to the posted signs. Call the (800) USA-RAIL for station hours. All stations have pay phones unless specifically noted. Track abbreviations: AMT = Amtrak, CN = Canadian National, CSX = CSX Transportation, NS = Norfolk Southern. 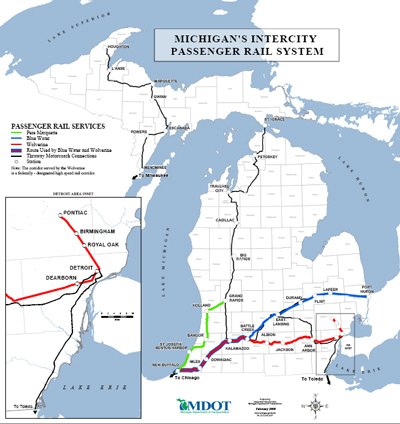 More information can also be found on the website for Amtrak Michigan services. You can check the current status of Amtrak trains by clicking here. 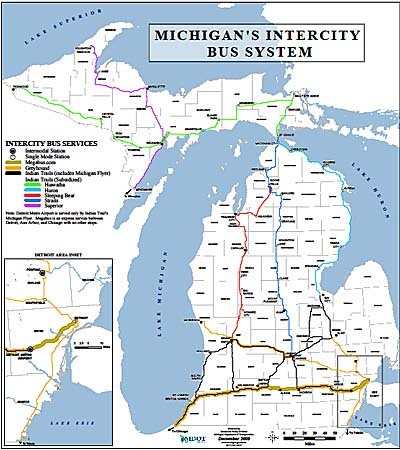 Michigan also has an extensive network of intercity motorcoach bus routes. Most routes are serviced by Indian Trails with some limited routes provided by Greyhound, Megabus and Metro Cars. An extensive review of many of the stops is not feasible since many are not much more than a bus sign or an address; or are subject to change according to local conditions. Check with Indian Trails for the most up to date information before your trip.